As the deadline for filing your self-assessment looms, this article gives you an example of how to calculate payments on account and discusses what penalties apply for late and underpayments. Now that the tinsel is down and the gym membership has been renewed, it’s time to think of the looming deadline date for filing our self-assessment tax returns. And it’s not just the self-employed who are affected – it’s higher rate taxpayers, company directors, anyone with more than one job or who have a buy-to-let property or need to pay a child benefit tax charge. Soon we will learn how many people miss this crucial date of 31st January – last year it was over 800,000 taxpayers – all of whom would have incurred a fine of some sort. As well as having to file the tax return, we also need to pay a balancing payment for 2014/15 and the first payment on account for 2015/16. Payments on account are based on what happened the previous year. For example, if you owe £10,000 in tax for the 2014/15 tax year then you need to have paid all of this by 31st January 2016. (You will have paid two payments on account based on the previous year’s tax bill and the balance is due in January 2016). You also have to pay on 31st January 2016 50% of £10,000 as a payment on account for the 2015/16 tax year and the same again on the 31st July 2016. If the tax liability is more than the previous year, then the balance is paid in January 2017. If your earnings reduce however and you owe less tax, then you will be refunded the overpayment. You can always apply to HMRC to have payments on account reduced if you think you will earn less during the current tax year. Be careful though as you will have to pay interest on any tax owed if your earnings did not go down as expected. What if you miss the deadline or underpay? If the deadline for an online submission of a tax return is missed, then the first fine is £100 – this applies even if you have no tax to pay. The penalties and interest then increase over time. As for the tax payment itself, interest is automatically charged on late and underpayments. Penalties are also charged if tax remains unpaid after certain time periods after the balancing payment is due on the 31st January. These penalties are all on top of the interest. The self-employed also need to remember that class 4 contributions will also need to be paid as well as any capital gains tax due for 2014/15. If you’re studying for your CII R03 exam, and you’re anxious about how you’ll do on exam day, grab our free taster to try out one of Brand Financial Training’s resources for yourself. Click the link to download the R03 calculation workbook taster now! 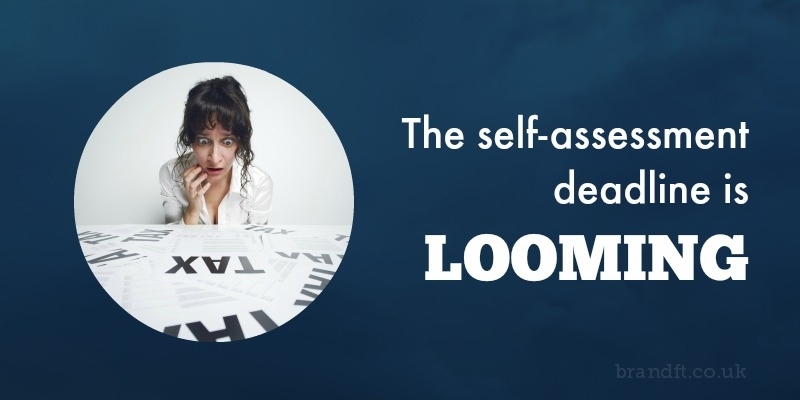 Do you have your self-assessment well in hand, or will it be a challenge to get it submitted in time?